The Brandeis University community mourns the death of Theodore C. Sorensen, the founding board chair of the International Center for Ethics, Justice and Public Life. Sorensen, most famous as a counselor and speechwriter for President John F. Kennedy, made Brandeis University and the Ethics Center one of his most significant commitments in the final decade of his life. The Center’s Sorensen Fellowship program for undergraduates honors his service and his spirit. 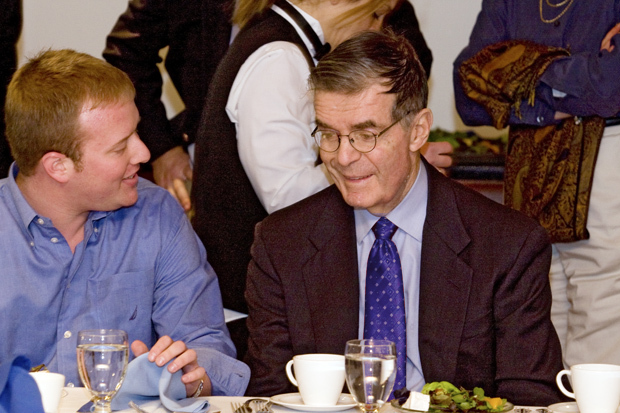 In 1999, President Jehuda Reinharz visited Ted Sorensen at his office at Paul, Weiss in New York to ask him if he would become the first chair of the advisory board for the newly formed center. Sorensen was skeptical, and he quizzed the president and center director Daniel Terris about Brandeis University’s aspirations for the new center. Persuaded of the University’s commitment to building strong bridges between academic and professional life, he agreed to an initial commitment of four years; eventually, he served as board chair until 2009. "Ted Sorensen inspired generations of young people to pursue their ideals and embrace public service,” Reinharz said following Sorensen’s death on Oct. 31. “We are grateful that during the last 10 years of his life he chose to bring his wisdom, his experience and his passionate quest for justice to Brandeis University as chair of the advisory board of the International Center for Ethics, Justice and Public Life." Terris called Sorensen “a source of guidance and inspiration for all of us at the International Center for Ethics, Justice and Public Life. He was also a personal mentor and friend who made his mark on my life with gentle prodding and generous support." Sorensen brought to the center the wisdom and practical experience of a man engaged in public life for a half-century. His reputation and extensive network of friends and colleagues also helped attract many other leading national and international figures to the center's board, including Kerry Kennedy, director of the Robert F. Kennedy Center for Human Rights, and Diego Arria of Venezuela and Kishore Mahbubani of Singapore, both of whom represented their countries as ambassadors to the United Nations. Beyond the Ethics Center, Brandeis University had a special place in Sorensen’s heart. He identified himself as a “a Danish Russian Jewish Unitarian.” The Jewish heritage came from his mother, Anna Chaikin, and while he identified himself with Unitarianism, he admired Jewish commitments to education, community and social justice. In addition to leading the advisory board and chairing the annual meetings, Sorensen provided advice and counsel to Terris and the center’s staff through constructive criticism, a generous spirit and an incisive sense of humor. As an international lawyer himself, Sorensen was particularly attached to the center’s work with international judges; he believed that the Brandeis Institute for International Judges was a major contribution to the strengthening of the world’s international courts and tribunals. Sorensen also was committed to the center’s focus on building peace. A conscientious objector himself as a young man, he retained a lifelong passion for peace-making. Though he was often most closely associated with JFK’s inaugural address, Sorensen frequently remarked that his favorite JFK speech was the address at American University in June 1963 in which the President called for a renewed commitment to peace in an era of potential nuclear destruction. Sorensen spoke frequently on the Brandeis campus, most recently in a talk about presidential inaugural addresses just before Barack Obama's inauguration in January 2009. Despite his role as a speechwriter, Sorensen contended that people concentrate too much on who wrote the speech rather than its substance. “A much more important question is not who penned particular words as a wordsmith, but why Kennedy’s values, principles, and policies that were stressed throughout that speech have been largely forgotten,” he said on that occasion. He also spoke at Brandeis following the publication of his autobiography, "Counselor: A Life on the Edge of History," published in 2008. The flagship undergraduate fellowship in the Ethics Center was renamed the Sorensen Fellowship in 2009, when Sorensen stepped down as chair of the board. Since its beginning, the center has supported Brandeis undergraduates to work overseas during the summer in organizations committed to issues of peace, justice, human rights, sustainable development, and democracy. In the past two years, Sorensen Fellows have worked in such venues as the International Criminal Tribunal for Rwanda in Arusha, Tanzania, Spirit of Youth Association for Environmental Service in Cairo, Egypt, and Experimental Theatre Foundation in Mumbai, India. Naming the fellowship for Ted Sorensen was meant to be a permanent tribute to a man who was passionately committed to the ideal of public service. Sorensen suffered a major stroke soon after becoming chair of the center’s board. He emerged after some months of rehabilitation with his mind as sharp as ever, but with his eyesight severely impaired. In the years that followed, he remained as active as ever, presiding over meetings, and then – despite that impaired vision — insisting on walking home from Brandeis House on the East Side across Central Park to his apartment on the West Side. He continued to lecture brilliantly, necessarily delivering his talks entirely from memory, yet still possessing the magic ability to speak in complete sentences and paragraphs, interspersing thoughtful commentary with incisive wit.